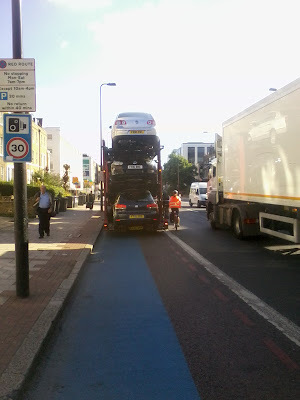 The "Executive Correspondence and Escalation Manager" (I kid you not) of Volkswagen UK has replied to my email asking why their delivery company, Paragon, were delivering some shiny new VWs on two transporters on Cycling Superhighway 7 (in a bus lane on a red route) opposite the garage at 73-75 Clapham Road, Lambeth at 08.30am on Wed 28 July 2010. This was in clear contravention of the road signage - which, as the photos I provided show, permits parking only between 10am and 4pm. Further to my previous email dated 2 August, I have now received a detailed response from Stephen Hucklesby, Managing Director at Paragon Fleet Solutions. Stephen acknowledges that the location where you saw their transporters parked is notoriously difficult to deliver to. Europcar and Hertz have branches on Clapham Road, Kennington, and Paragon have been advised by the authorities (police)that deliveries for these branches were to be delivered to the loading/unloading box, which is where their transporter was parked. 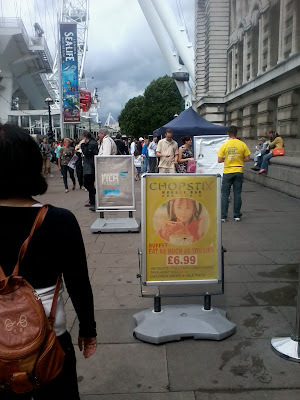 He refers to your photo 1 which shows a staggered red line, within the white line (bus route). 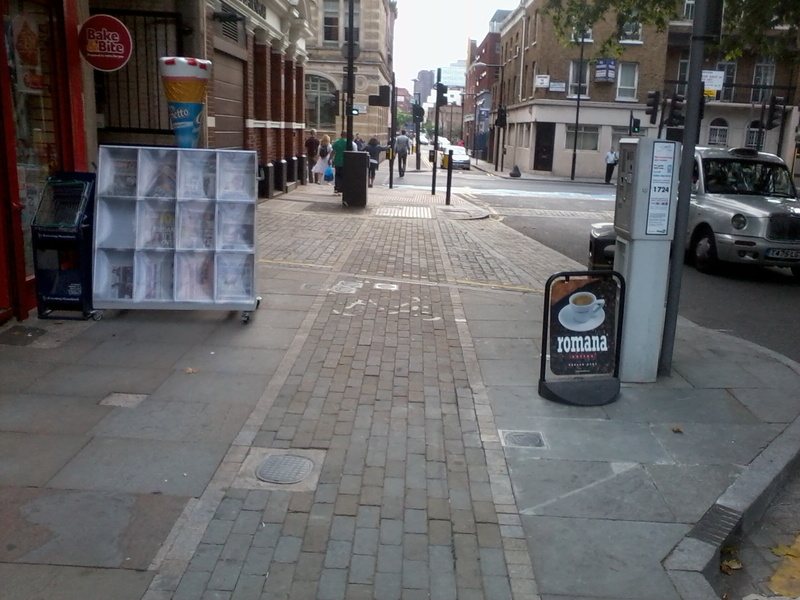 This signals the loading/unloading area supported by your photo 2, which shows the start of the unloading bay. The transporter is parked exactly where Paragon have been instructed to park. Paragon, like Volkswagen, take their responsibilities very seriously in this regard and always aim to ensure they satisfy all parties when delivering and collecting in these challenging areas. At this location, Paragon continue to work with the local authority and police to ensure a safe and compliant environment for the public and other road users. I am aware that the Superhighway is a new concept that has recently launched in London and that the Transport for London website does state that due to congestion, vehicles may be found in the lane and cyclists should take care in such cases. Either way, Paragon is acting within police guidelines. I hope this information answers your questions. So, that's clear then. If you're delivering a major contributor to congestion you can park on a Cycle Superhighway during its key hours of operation, while cyclists should take care as due to congestion vehicles may be found in their lane. 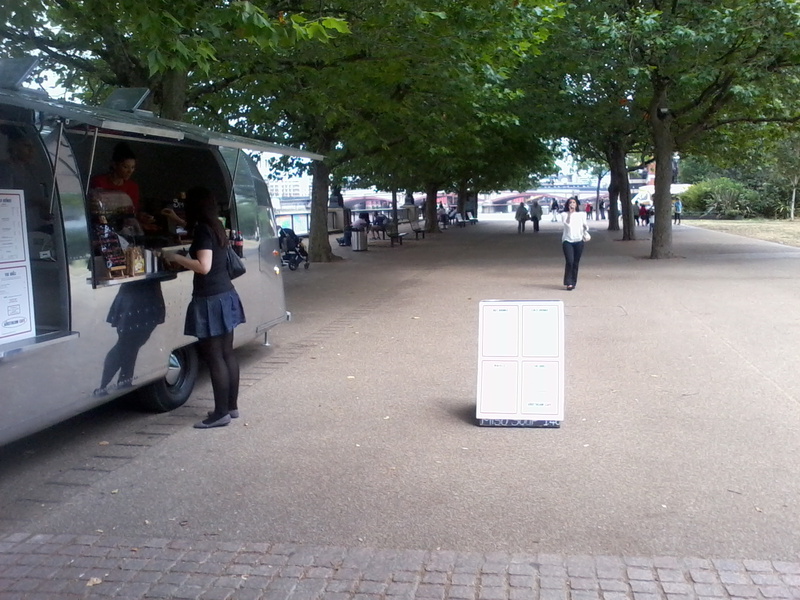 Shirayama Shokusan Company Ltd are referred to as Shiriyama in the draft Southbank and Waterloo Cycling Strategy. They own the former County Hall and the bit of Belvedere Road between Westminster Bridge Road and Chicheley Street - the bit which is almost impassable by bicycle at either end and has no cycle parking along it. "Fig 10 above shows the cycle provision in place at each end of the privately-owned section of Belvedere Road, broadly described as the County Hall section. As revealed, signage, routes and markings are inadequate and representations must be made to the landowner Shiriyama to improve these according to an agreed scheme. 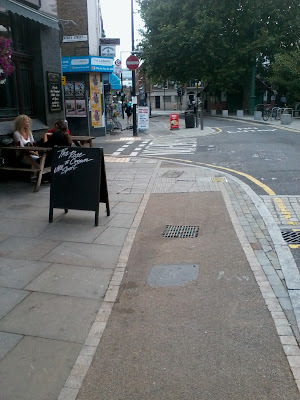 Should Shiriyama decline to make the suggested improvements, an alternative route may be considered via currently underutilised Forum Magnum Square, which is owned Galliard Ltd, and through a cycle lane created alongside the bus lane at Addington Street." I sense that the South Bank Employers Group and Lambeth Council are frustrated by the company - as no doubt are many people who happen to ride bikes. In fact, page 32 of the report says £4000 has been allocated with Lambeth Approved Cycle Route Complementary Measures 2009 to 'negotiate with landowners on removal of obstacles in Belvedere Road'. I bet that's Shirayama they're talking about. "£100,000 from the development in County Hall Riverside Building which is the final payment from developers Shirayama Shokusan Co Ltd in relation to the employment and training obligation in the agreement signed back in 1993. This brings to a close a long and arduous pursuit by the Council." As can be seen from the S 106 Schedule the implementation of Section 106 Agreements, there are a range of direct obligations to be implemented by the developer that need to be monitored and pursued with developers. In terms of the County Hall Riverside Building S106 Agreement, there are a number of outstanding obligations to be undertaken by the developer, which I would bring to your attention to give a complete response to your queries. use of children of persons employed on the site. Despite some initial discussions with Social Services on the requirements to run an operational nursery, this service has not to date been provided. I understand there have been issues in relation to the provision of necessary information to Social Services, and whether the County Hall riverside Building can provide a suitable nursery location in line with latest nursery provision guidance. • Under Clause 3.10 a Children’s Library was to have provided within the County Hall, Riverside Building. Although a room has been designated for the Children’s Library to go into, no Library provision has been made. In discussions with the former Head of Library Services, David Jones, it was agreed that the Council would specify and cost out the implementation of a library facility, The specification costs identified would be used to either to pursue the owners Shirayama to implement as in the agreement or alter the agreement for some form of alternative provision. The location of proposed Children’s Library is not ideal in terms of access. suppose to submit a proposal for a traffic management scheme for Belvedere Road (adjoining County Hall), and implement them subject to the Council approval. A scheme was submitted after the completion of the North and South Block residential schemes. However, the Council has not approved the details. outstanding issues for the County Hall agreement. This will require further corporate response and action on how best to deliver the original objectives behind the Section 106 Agreement, and possibly some alterations to original agreement. It is proposed to establish a cross-directorate officer group to coordinate implementation in future for major Section 106 Planning Obligations." I wonder what the original S106 and planning conditions were for County Hall when it was sold to this unattractive company. What good's a rule if you can't enforce it? 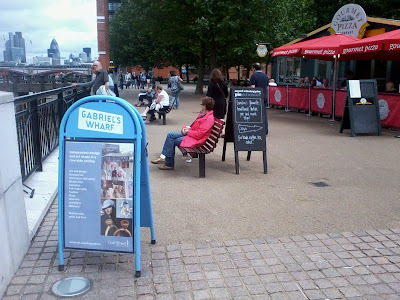 • Private landowners Southbank Centre and Coin Street Community Builders to support enforcement of no cycling rule on the River Walk between Oxo Tower Wharf and London Eye. 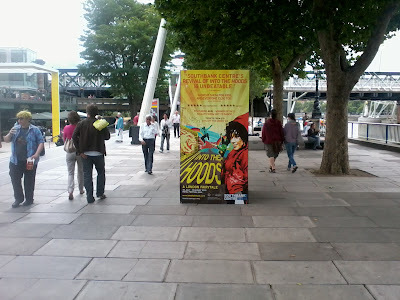 Lambeth Council to support educative methods and signage to encourage cyclists to use designated routes away from the River Walk (between Westminster and Lambeth Bridges), with no enforcement of cycling ban." Thank goodness for a dose of reality. 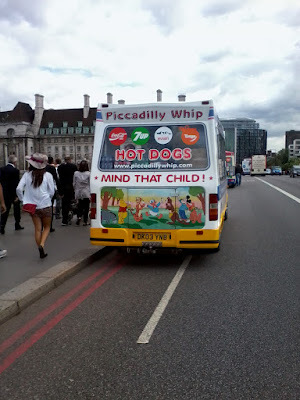 We know that illegal trading on a regular basis shouldn't be possible in central London from a parked vehicle (big enough to have enough Semtex to make a real mess) in a major security zone, within a bus lane, and a cycle lane on a red-route . It breaks so many laws it's not true. 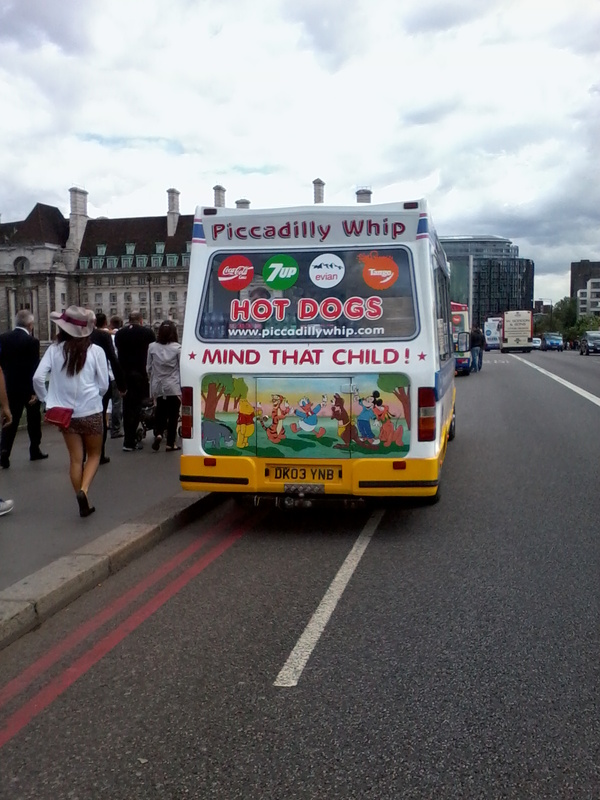 Indeed, enforcement against these ice-cream van traders on Westminster Bridge is a priority of TfL. Yet today the organised criminals were out in force yet again - while a police support officer looked on powerlessly. 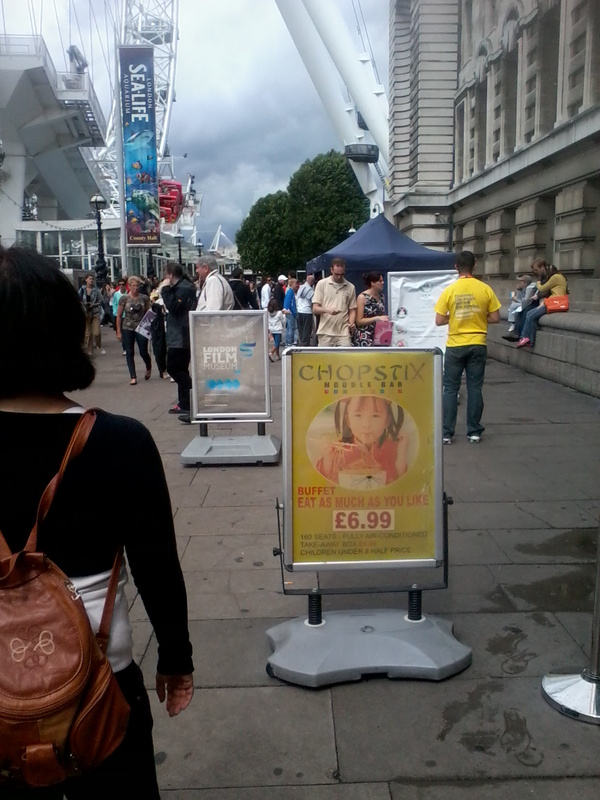 Half an hour later (12.30 - 1pm) and no ticket had been issued, no request to move on made, no arrests. Whether the authorities wish to enforce considerate cycling or no cycling makes no difference to the reality that either option requires resources. Without resources there's no point in putting up signs banning cycling because they'll be ignored by the type of person who talks on their phone while driving. Law abiding, considerate cyclists will however feel compelled to mix it with the HGVs on Belvedere Road. What kind of result is that? And, if resources can be found for enforcement, surely enforcing considerate behaviour by all space users should be the priority! Putting the knee-jerk desire to ban cyclists from the riverside aside, the South Bank Strategy has many good points, including acknowledging how rubbish the Belvedere Road route is currently. It recognises the need to create cycle routes that cyclists will enjoy using. This is the real way to encourage cycling (with all the pluses of reducing CO2, NOx, noise pollution, heart-attacks, diabetes etc.) while also reducing conflict with pedestrians. The report quotes TfL's 2008 'Attitudes to Cycling' study which found that nine out of ten Londoners agreed with the statement that 'traffic makes people afraid of cycling in London'. It also states, 'The Spine Route (Upper Ground and Belvedere Road) serves as a service road for HGVs, a bus route, a national and local cycle route and a key walking route'. How they've managed not to notice it's also used by a zillion diesel-exhaust-bellowing taxis a day, not to mention mini-cabs and private cars, is beyond me. I have yet to find in the report any suggestions on ways to reduce motor-traffic usage in the area. Examples of sustainable options include finding ways to reduce the number of HGVs needed (eg reusable crockery rather than disposable; water fountains rather than bottled water on sale); re-routing taxis to have drop offs along Stamford Street (a short walk is good for you and adaptions can be arranged for the disabled), and a road-closure at some point (permeable to pedestrians and cyclists) to prevent rat-running motor traffic. 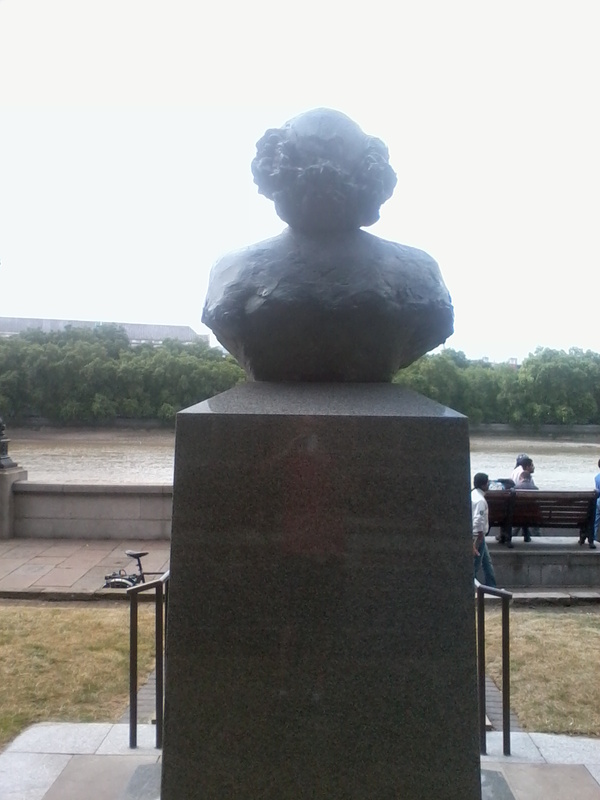 On the Albert Embankment is a fine memorial to the courageous Special Operations Executive agents of the second world war. The SOE was secretly formed for the purpose of recruiting agents, men and women of many nationalities who would volunteer to continue the fight for freedom, by committing acts of sabotage in countries occupied by the enemy. It may be time for a similar organisation to battle for freedom against the tyranny of the South Bank Employers Group. Their draft Cycling Strategy says, "The River Walk is not a designated cycle route and private landowners in the study area recommend that a ban on cycling in this location be enforced. Although it is technically illegal to cycle on the River Walk....."
The SBEG want to force cyclists to be on the road and enjoy this view of the memorial instead. But look, here's an underground photo taken by the Resistance below Westminster Bridge where it is "technically illegal to cycle" - Good grief, sabotage seems to have started already with markings installed to indicate where cyclists and pedestrians should be in the tunnel. Cunningly they appear to have been aged to look as though they've been there for years. 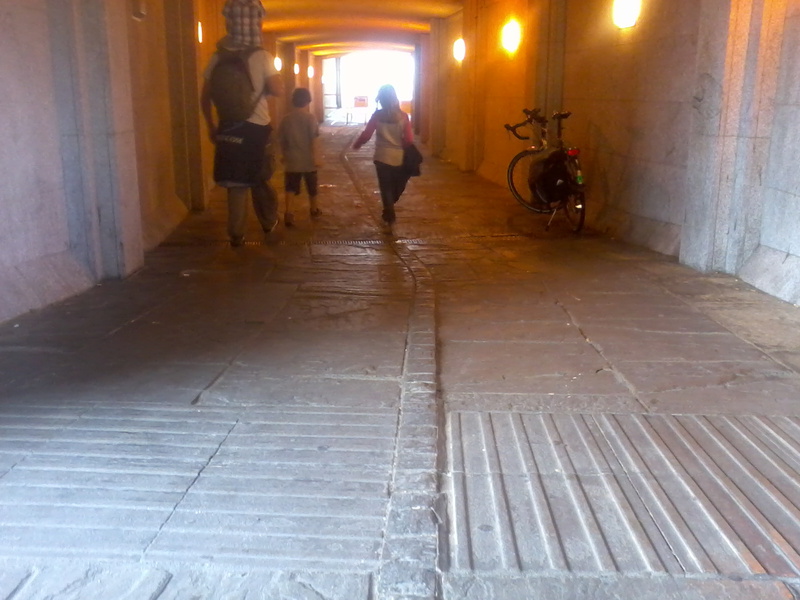 It is of course reassuring to know that "A number of options were discussed that assessed the various options available to landowners, with the safety and security of pedestrians on the River Walk as the paramount consideration." May the reborn SOE descend, throw these obstructions into the recycling bins and ban those responsible from the River Walk forever. 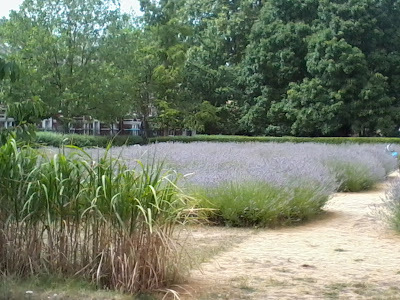 Next time you're cycling down Fentiman Road nip into Vauxhall Park and admire the Lavender field which looks and smells sensational. Great fun being had this afternoon at Pedal Power Kennington discovering the joys of rubber cement, patches and pumps. "Commissioned by London Borough of Lambeth and authored by South Bank Employers' Group, the strategy, downloadable from Lambeth's website, aims to improve the interface between cycling and other modes of transport, reduce crime, improve safe cycle routes, encourage take-up in workplaces and increase parking provision. 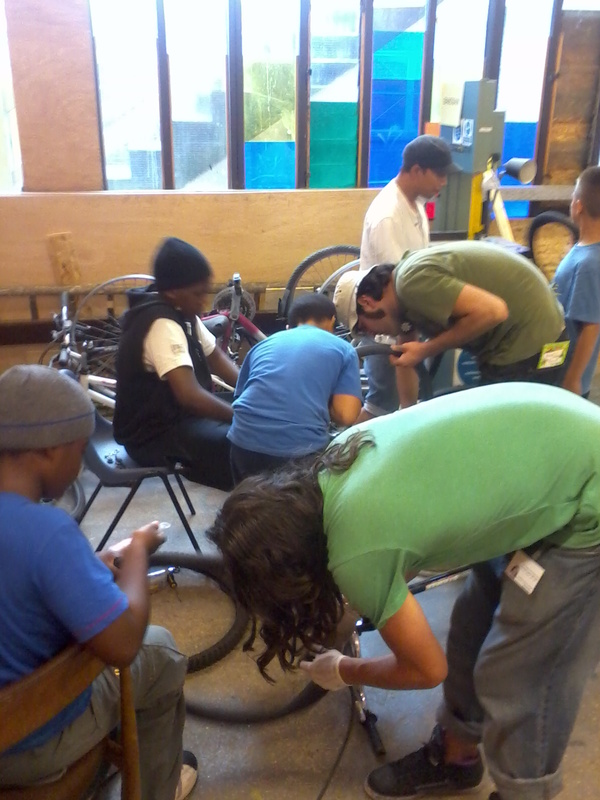 Responses can be sent to cycling@lambeth.gov.uk. While Lambeth are unable to respond to all submissions individually, all comments will be considered and incorporated where appropriate. 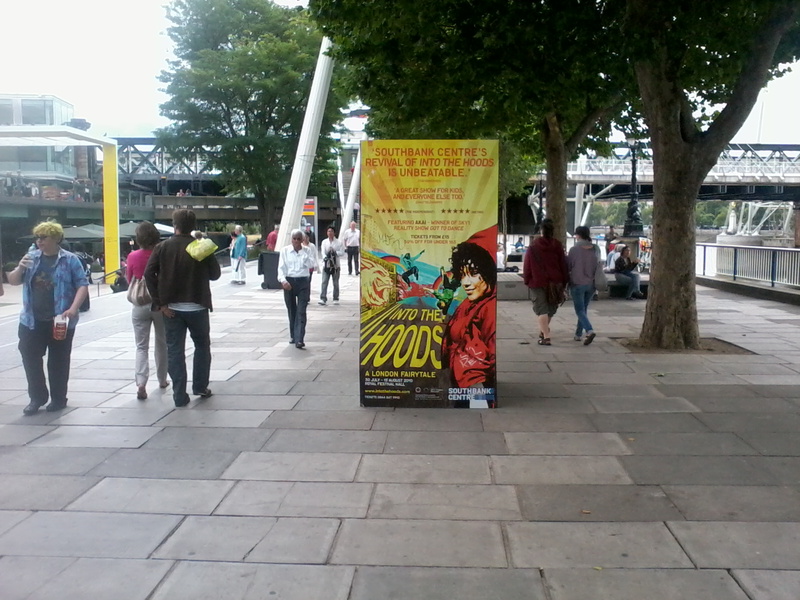 The consultation deadline is 10 September 2010." With around 11,000 staff across the Guy's and St Thomas' NHS Foundation Trust there's quite a lot of shuffling back and forth. You'd think, given that Active Travel has been around for a few years, that they'd have a lovely cycle route worked out between the two hospitals. Here are my thoughts, aiming to avoid major roads and the current construction work on the southbank. I welcome alternative suggestions. Here's the largely off-road route, in the main following National Cycle Network 4. It's the most mellow and safe route for St Thomas' and Guy's Hospital Trust employees, though at times somewhat congested with pedestrians. From a risk-assessment perspective I think this is the one the Trust should recommend for those who are understandably nervous about cycling in traffic while at work. Options include walking the bike from the entrance to St Thomas' to the start of the on-pavement cycle path by Westminster Bridge unroundabout rather than cycling on Lambeth Palace Road. You also cycle along the north-side shared-use pavement under Blackfriar's Bridge rather than the road, going either way. 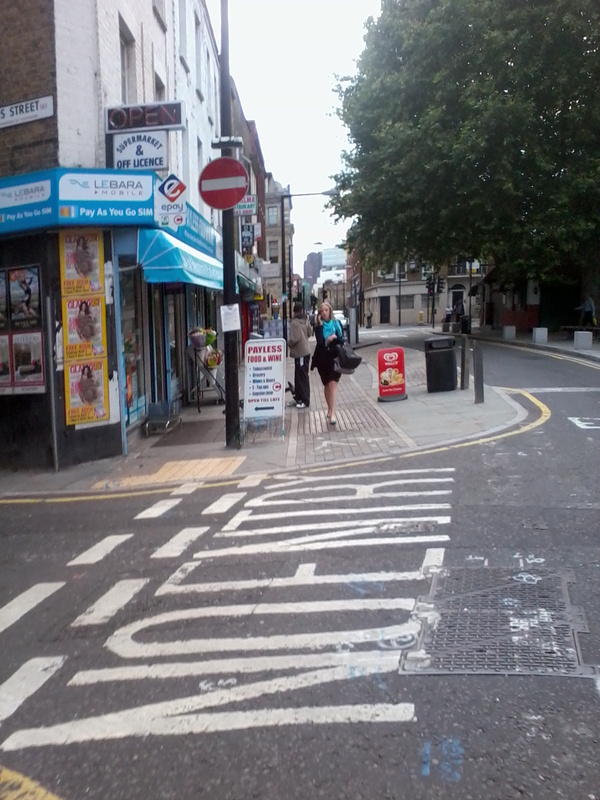 The route requires you to walk along one-way Bedale Street when going towards Guy's. In both directions you have to walk your bike across Borough High Street between Bedale Street and St Thomas' Street. 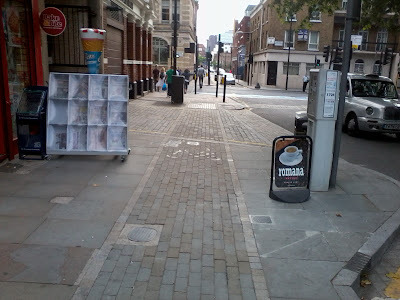 Given the construction work happening on The Shard, cautious cyclists may prefer to walk the bike on the pavement along St Thomas' Street. Here's the St Thomas' to Guy's Hospital on-road route. It includes an illegal right turn out of St Thomas's but otherwise is I believe legal and on relatively quiet roads. 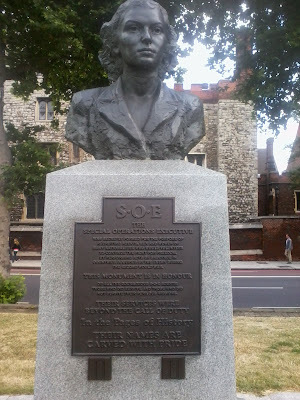 Here's the Guy's to Thomas' Hospital on-road route. It's quite faffy when you get close to St Thomas' but I think it's legal! The Trust could usefully use its clout to improve Active Travel conditions in the area for its employees, patients and visitors. No, I'm not having a go at the person walking in the cycle path on Union Street as you're coming towards the junction with Cycle Superhighway 7. She has a choice between the cycle path and the road since the shop keeper and the urban realm planners have conspired to use up all the pavement. 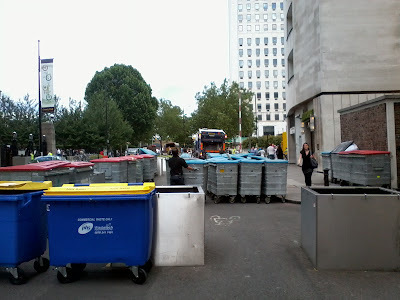 I spent quite a while today trying to work out a safe, direct, appealing and mellow cycling route for staff at St Thomas' Hospital to take to get to Guy's Hospital. I'm thinking of ordinary people, rather than Lycra Lads, who, if presented with a pleasant cycle route to get from one hospital they work at to another they also work at, might decide to pootle on a bike. It's going to take quite a while to find a decent route - currently many of the streets that seem sensible are ruled out through being one-way. 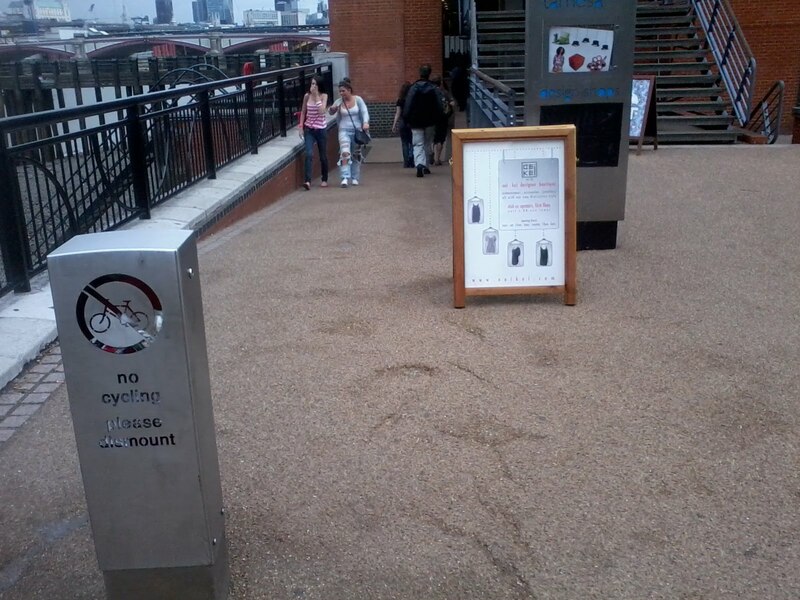 Surprisingly, as this sign in Royal Street states, facilities for cyclists were to be improved around St Thomas' Hospital and Lambeth North in 2003. Given they're pretty grim now they must have been stunningly awful before. Or maybe the sign went up but the work didn't happen? 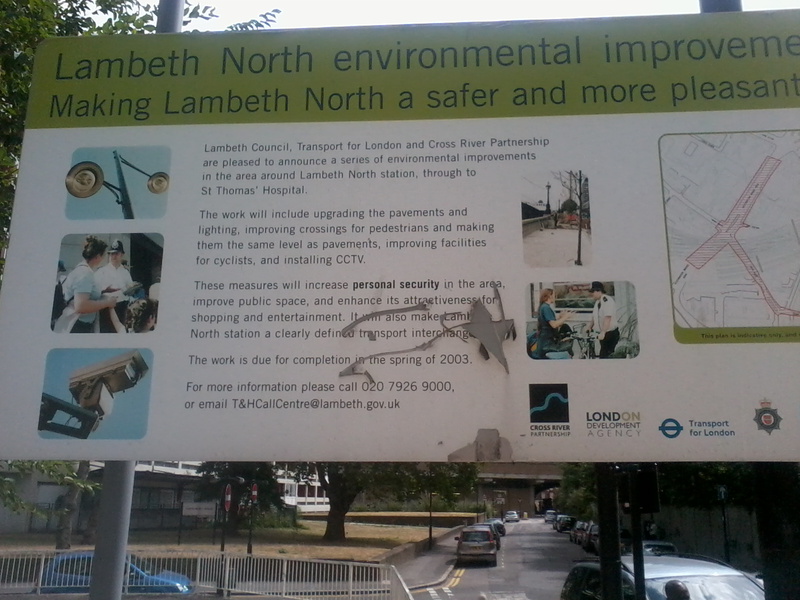 Either way, a small step towards making North Lambeth 'more pleasant' would be the removal of this knackered and time-served sign.